Cedarburg, Wis. – Native Fiber at the Wisconsin Museum of Quilts & Fiber Arts (WMQFA) brings together a breathtaking array of work by contemporary Native American fiber artists from throughout the Great Lakes. 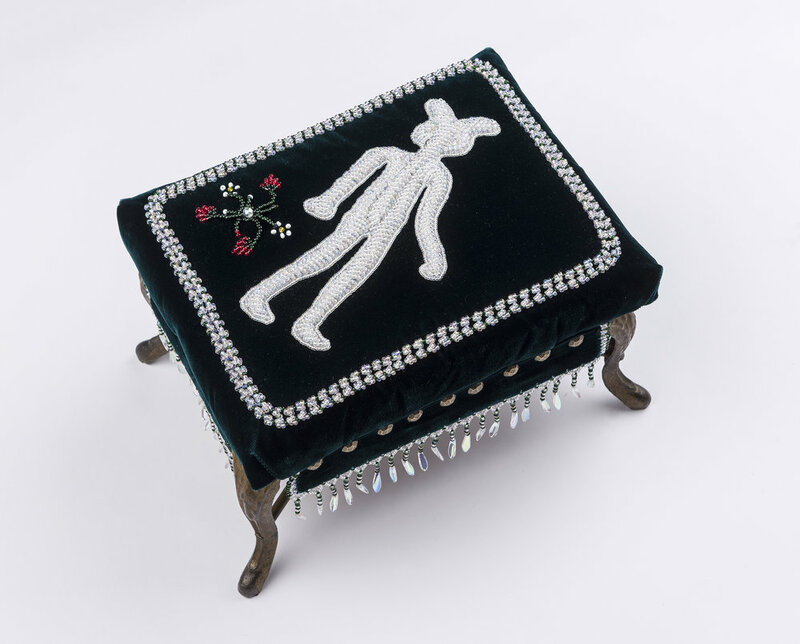 Curated by Karen Ann Hoffman, a renowned Iroquois raised bead worker, the exhibition features an expansive definition of fiber art, from quillwork to cordage, bead work, weaving, birch biting, leatherwork, and quilting. Under these artists’ hands, Indigenous fiber art traditions are both maintained and advanced, communicating timeless stories and addressing modern themes. Illuminating the astonishing ways Native American artists explore and alter extraordinary materials—black ash, birch, fur, and corn husk, to name a few—the exhibition comprises the work of thirty-one artists and one artist guild, representing twenty tribal nations. Every artist’s work falls under the Indian Arts and Crafts Act of 1990 and is considered authentic Indigenous art. Many of the works of art in the exhibition were created specifically for Native Fiber. Repeating iconography and subjects run throughout, including symbols of healing, forgiveness, women’s experiences, subjugation, and transformation. Together, the works attest to the diverse life and vibrancy of Indigenous fiber arts today. Native Fiber will be on view at WMQFA from January 17 through April 28, 2019. WMQFA will host a gallery night for members and artists on Saturday, January 26, from 5:30 p.m. to 7:30 p.m. Additionally, Karen Ann Hoffman will lead a class on Iroquois raised bead work at WMQFA on Saturday, January 26, from 9:00 p.m. to 3:00 p.m. This exhibition is supported by grants from Maihaugen Foundation, Inc. and the Wisconsin Arts Board. The artists featured in the exhibition include Lily Antone-Plass (Oneida Nation of Wisconsin), Sarah Berthelet-Villa (Oneida Nation of Wisconsin), Binesikwe (Red Cliff Band of Lake Superior Chippewa), Shirley Brauker (Little River Band of Ottawa), Kelly Church (Ottawa/Pottawatomi), Wilma Cook (Mohawk), Debra Fabian (Oneida Nation of Wisconsin), Karen Elise Goulet (White Earth Ojibwe), Martha Gradolf (Winnebago Tribe of Nebraska), Carla Hemlock (Kahnawake Mohawk Nation), Karen Ann Hoffman (Oneida Nation of Wisconsin), Samantha Jacobs (Seneca), Holly John (Seneca), Penny Kagigebi (White Earth Ojibwe), Rick Kagigebi (Lac Courte Oreilles), James Kelly (Oneida Nation of Wisconsin), Pat Kruse (Red Cliff Band of Lake Superior Chippewa), Julia Marden (Aquinnah), Linda Lou Metoxen (Diné), Penny Minner (Seneca), Native Roots Arts Guild (Iroquois), Salisha Ninham (Oneida Nation of Wisconsin), Melanie Tallmadge Sainz (Ho-Chunk), Scott Shoemaker (Myaamia), Stefanie Sikorowski (Oneida Nation of Wisconsin/Chickasaw Nation), Talon Silverhorn (Shawnee), Christopher Sweet (Ho-Chunk), Chholing Taha (Cree), Jeremy D. Turner (Shawnee), Shannon Marie Turner (Diné), Michelle D. Watson (Diné), and Jason Wesaw (Pottawotomi). Native Fiber is curated by Karen Ann Hoffman, an Oneida artist currently residing in Stevens Point. Hoffman studied Iroquois raised beadwork under Samuel Thomas and Lorna Hill, two of the most prolific contemporary Native American bead workers, and has become a respected teacher of the tradition. Her works of art have been shown nationally, including at the Smithsonian Museum of American Indian, and are represented in many museum collections. Hoffman serves on the Wisconsin Arts Board. - Birch Bark Panel and Rice Keeper by Pat Kruse (Red Cliff Band of Lake Superior Chippewa). For more than thirty years, Kruse has been harvesting birch bark to make elaborate baskets and panels using birch’s flexible wood. Recently, inspiration for his birch bark creations has come from the opportunity to study ancient birch bark baskets in the archives of the Minnesota Historical Society. There are few practitioners of birch bark art practicing today and Kruse is continuing the tradition, while passing it along to his son and apprentice. - Twined Doll Turkey Feather Mantle by Julia Marden (Aquinnah). Internationally-recognized Eastern Woodland artist Marden practices twined basketry, an ancient form of weaving that involves the twisting of wefts around the warp to create a variety of designs. Marden’s Twined Doll Turkey Feather Mantel is a doll-sized twined cape covered in turkey feathers, with each feather laboriously woven into the cape. - Weaving Ourselves into Forever—A Healing Shawl by Karen Elise Goulet (White Earth Ojibwe). Goulet has been showing her art nationally and internationally for twenty years. She works in a variety of textile art, including needlework, quilts, and weavings. She is renowned for her star quilts, a sacred symbol that for Native Americans connotes honor. For Native Fiber, she has created a stunning new shawl. - Made in Japan by Martha Gradolf (Winnebago Tribe of Nebraska). Martha Gradolf is a decorated weaver. She creates weavings that focus on the stereotypical images of American Indians, often utilizing found objects woven into her tapestries. Made in Japan features hand-dyed strips woven simultaneously in two layers. Ceramic Indians (old-fashioned salt-and-pepper shakers made in Japan) adorn the top of the piece and brass cone-shaped jangles fringe the bottom.